Chronic pancreatitis is a chronic clinical disorder characterized by irreversible damage to the pancreas and the development of histologic evidence of inflammation and fibrosis, and eventually the destruction and permanent loss of exocrine and endocrine tissue. 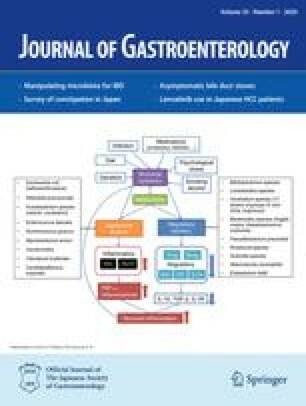 A nationwide survey in Japan revealed an increase in the total number of patients treated for chronic pancreatitis from 32 000 in 1994 to 42 000 in 1999. The overall prevalence and the incidence rate of chronic pancreatitis also increased, from 28.5 and 5.4, respectively, in 1994 to 32.91 and 5.77 per 100 000 population, respectively, in 1999. Diagnostic criteria for chronic pancreatitis in Japan were proposed by the Japan Pancreas Society in 1995 and revised in 2001. The criteria were established to rule out false-positive cases and to confidently diagnose definite and probable cases of chronic pancreatitis, and thus easily detect advanced chronic pancreatitis, but the criteria are unable to lead to the early diagnosis of chronic pancreatitis. Cancer is the major cause of death in patients with chronic pancreatitis in Japan (49.6% of all deaths in patients with chronic pancreatitis). Clarification of the mechanisms by which possible chronic pancreatitis progresses to probable or definite chronic pancreatitis, and to pancreatic cancer, is an important research goal. Because even chronic pancreatitis defined as irreversible appears to be reversible for some time in its clinical course, there is an urgent need to develop methods for diagnosing reversible chronic pancreatitis, and to prevent the transition from chronic pancreatitis to pancreatic cancer.